We’d love your help. Let us know what’s wrong with this preview of Searching for Alpha Centauri by Gary Spetz. Three complaisant kids, two stormy parents, one anxious French poodle, too many U-haul trailers, and the potholed road of the early 1960s. Searching for Alpha Centauri: A Boyhood Memoir (formerly titled Easy Hearts) is American Public Television artist Gary Spetz's absorbing tale of living a nomadic life with an impetuous mother, a discontent casino-security-guard step-fath Three complaisant kids, two stormy parents, one anxious French poodle, too many U-haul trailers, and the potholed road of the early 1960s. 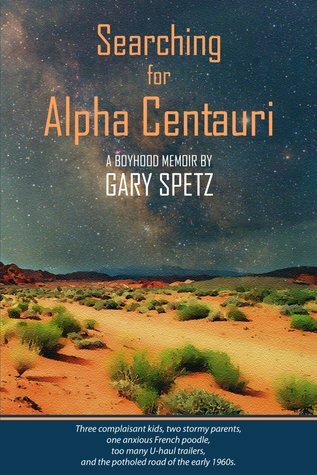 Searching for Alpha Centauri: A Boyhood Memoir (formerly titled Easy Hearts) is American Public Television artist Gary Spetz's absorbing tale of living a nomadic life with an impetuous mother, a discontent casino-security-guard step-father, a kid-loathing French poodle, and two older, all-too-often unpleasant, siblings -- during the turbulent early 1960s. The artist/author paints his experience with both humor and sensitivity, adeptly portraying his ever moving landscape. Effectively blended into Searching for Alpha Centauri's backdrop is the author's keen attention to the world events unfolding around him. These were the days of an impending nuclear war, an exciting new space race, an escalating conflict in Vietnam, a rising civil rights movement, the invasion of Beatlemania, and the shocking assassination of a President. To the author, this mix of colorful and dark days was, indeed, "the best of times" and "the worst of times." To ask other readers questions about Searching for Alpha Centauri, please sign up. The thing I love most about memoirs is that each one gives me a clear view of a time before I was alive. This is the first time I've ventured into the 1960's and what a wild, enjoyable ride it was! I enjoyed the storytelling ability of Mr. Spetz and the clear honesty of a boy's journey through childhood. Memoirs are always hard for me to rate and review. To me there really is no way to rate someones life/memories. One of my favorite things about this genre of book is that you get to see into the mind of someone else and see their way of thinking. It was nice to go back to the 60s. A good read at times I will admit I got a little bored but worth the read. I read up to page 250, but now I gave up. I really enjoyed the first 150 or so pages but then it got more and more repetitive and for me rather boring. Gary Spetz is also known as the writer-artist-host of three popular Public Television series: Painting Wild Places, Watercolor Quest and Color World. He is a signature member of the National Watercolor Society and has been published in various art magazines and books, including Watercolor, Artists, Watercolor Magic, Searching For The Artist Within and Art From The Parks. His artwork has been inclu Gary Spetz is also known as the writer-artist-host of three popular Public Television series: Painting Wild Places, Watercolor Quest and Color World. He is a signature member of the National Watercolor Society and has been published in various art magazines and books, including Watercolor, Artists, Watercolor Magic, Searching For The Artist Within and Art From The Parks. His artwork has been included in the “Top 100” of the National Park Academy of the Arts. Gary has hosted, wrote, filmed, and co-produced—with his wife, Marlene—111 painting and travel episodes for American Public Television (APT), the National Educational Telecommunications Association (NETA), MontanaPBS, and Janson Media. “By the spring of 1963, Las Vegas was made up of an odd convergence of gamblers, gangsters, and government. All three forces, intentionally or unintentionally, catered to every kind of human weakness. Although the aboveground nuclear blasts were gone, the town was still full of glitzy, beckoning casinos; flamboyant, roguish celebrities; down-and-out and entrepreneurial prostitutes; and notorious, brutal criminals. By now it had gained its much deserved reputation as “Sin City”—universally considered a town where “just about anything goes.” And surrounding it were the infamous “holes in the desert.” Many of Las Vegas’s problems were known to be buried in those same holes.